AMONG the splendid 19th-century photographs that make up the exhibition Picturesque Views, shown in Germany earlier and currently on view at the Museum Rietberg in Zurich, one of the most striking is that of a long shikara — gondola-like boat — gliding quietly on the still, mirror-like waters in Srinagar. 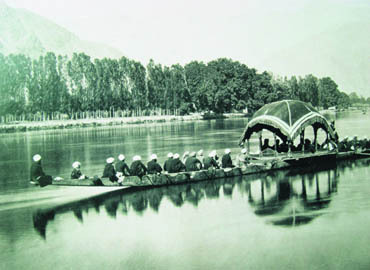 In the centre of the shikara is an exquisitely stretched dome-shaped canopy under which a ‘Commissioner’ — possibly the British resident in Kashmir — is seated, along with his entourage while ‘outside’, at either side of the boat is seen a whole phalanx of turbaned men, some of them rowing, others faceless attendants. The boat makes its progress as tall poplars on the bank, standing in a row, look on and mountain peaks loom at a distance, etched but barely visible against the sky. It is a crisp, affecting image: serene and elegant, redolent of times gone by when things were quieter and life moved at a different pace. Samuel Bourne, the celebrated photographer, who took this picture, also recorded almost the exact moment of his taking it in words, for in that moment "every leaf was still, and `85 not a breath or whisper of a breeze disturbed the image mirrored in the depths of the glassy stream", adding that: "my readers will understand with what exultation I, as a photographer, feasted my eyes on this scene of unruffled beauty". This, however, is not a piece on photography, but on houseboats of which I was reminded by the Bourne picture. My own feelings for houseboats — literally, ‘flat-bottomed, barge-like boats fitted for use as a floating dwelling but not for rough water’, generally moored close to the bank — are a bit mixed, for if they recall for me happy days that I spent living in them with the family on the Dal in Srinagar, they also put me in mind of the time that I fell off approaching one of them as a schoolboy and nearly drowned. But I am well aware of the affection in which they are held, and how instantly they conjure up visions of leisured living surrounded by the beauties of nature. They are not by any means exclusive to Kashmir — one knows of other lands, Thailand, Indonesia, Vietnam, the Philippines, China, even the United States, among them — but it is not easy to think of Kashmir apart from them, for the image of the Valley would remain incomplete without them. There they come in various shapes and sizes and levels of luxury: large and small, many-roomed or single units, bungalow-like or narrow and sleek, plain or adorned, exquisitely carved out of walnut wood sometimes, furnished with opulent carpets and embroidered drapes. Some 1,200 of them were once known to be available for hire by tourists on the Dal, the Nagin, the Char Bagh: a wonderful substitute for hotels. Whatever else one might remember, at the end of a vacation and long afterwards, is the name of the houseboat in which one stayed in Kashmir. The name that comes to my mind most effortlessly is ‘Suffering Moses’ — an odd choice — but it is not that of a houseboat for hire: it was a kind of off-shore, double-storey shop that used once to sell the most exquisite of Kashmiri crafts, and I hope that it is still there. How or why it was so named one would never know: if asked, the owners might simply have said that it has come down from "angrezon ka waqt". But I did, per chance, come upon a delightful article by Peerzada Arshad Hamid in a Kashmir publication, which spoke of what was behind the names of houseboats in Kashmir, so many of them of foreign origin. Till the fifties of the last century, Europeans, especially Englishmen, used to come to Kashmir to live in houseboats and it is they who often named them, the Peerzada says. There are stories, some amusing, others romantically sweet, behind many of them. Behind, for instance, the name of the houseboat: ‘Butterfly’. The present-day owner of that houseboat, Mohammed Sultan Baktoo, tells it like this. My grandfather, Ghulam Ahmed, he says, used to hire himself out to tourists on their sojourn in the valley, serving mostly as a menial: carrying loads, cleaning, cooking etc. Once a German tourist, Hans Coatman (that, at least, is how he is remembered), hired Ghulam Ahmed who accompanied him to Pahalgam where Hans and his companions started fishing in the Lidder. As they sat with their lines in the waters of the river, waiting for their catches, Hans’s eye caught a beautiful butterfly hovering around them. Turning it into a game, Hans asked his companions to stretch their arms, saying that if the butterfly landed on the hand of one of them, he would grant him a wish. As luck would have it, the butterfly came to rest on the hand of Ghulam Ahmed. What was his wish? Hans asked. And poor Ghulam Ahmed, who had always dreamt of a better life, asked for a houseboat. The wish was granted. Hans paid him the money to build, or buy, for himself a houseboat with just one condition: he would name it ‘Butterfly’. Not un-often there were other, sometimes quirky, reasons. There were of course local Kashmiri names at hand: names like ‘Dilruba’ (heart-throb) or ‘Vizemal’ (lightning). But it was the ‘sahibs’, according to an elder among houseboat owners of today, who had to be kept in good humour. Sometimes the owners would even agree to change the names of their boats to please a steady client. There was, thus, the case of ‘Royal Glory’. The houseboat used once to be called ‘Hillview Queen’, but a tourist, Benjamin Brown, who used to come regularly and became friends with the owner, Abdul Khaliq Gassi, asked him if he could change the name to ‘Royal Glory’, the last being the name of his lady love. The request was immediately acceded to, and ‘Royal Glory’ it is, till today. The boat called ‘Shielann’ is named after the wish of a tourist who wanted to commemorate in the name of his favourite houseboat the names of his two daughters, Sheila and Ann. And so on. It does not take too much to guess how boats came to be christened as ‘Mona Lisa’, ‘Australia’, ‘Mermaid’, or ‘Wordsworth’. And, again, not much surprise if some tourists would boast of having once stayed in the ‘Buckingham Palace’, or ‘Versailles’, even if those were the names of Kashmiri houseboats. There is history here, in these names, and romance. Incidentally, also, money to be made. I learnt on the internet that a woman in the United States has advertised, asking for suggestions for a name to be given to her recently restored 52-feet houseboat. There is a reward at the end of it, but also a catch: "We need help, but nothing dirty or suggestive: we have three girls. Thanks."